It’s happening! Instinct Dog Training Inc. is overjoyed to announce that the company’s vision of A Kinder World through Dog Training™ is coming to Northern New Jersey! The first Instinct Dog Behavior & Training® franchise location, dubbed “Instinct NNJ,” is slated to open late 2018/early 2019. Location scouting is currently underway. Instinct Dog Behavior & Training franchise facilities offer dogs and owners kind, practical training and behavior help from certified trainers and behavior consultants, for everything from basic manners and obedience to complex behavior issues involving fear, aggression, and anxiety. 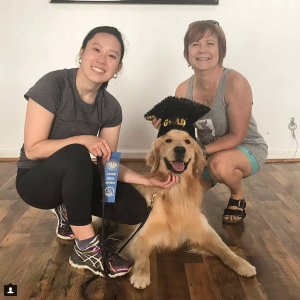 Services include private lessons, group classes, free puppy and “Alumni” classes, Instinct’s signature positive reinforcement Board & Train camps, and Alumni boarding. The NNJ franchise is owned by an impressive and highly qualified team: board certified veterinary behaviorist Dr. Emily Levine, DACVB, and behavior consultant Suze Cullinan, CDBC, currently a team member at Instinct East Harlem. The upcoming opening of Instinct NNJ is also an exciting step toward Instinct Dog Training Inc.’s goal of increased partnership and collaboration with veterinarians and veterinary behaviorists in an effort to raise the overall standards of training and care within the unregulated dog training industry. For dogs, for owners, for hope and kindness, and practical help for behavior issues big and small. For #trainingcampnotbootcamp. For a new and better standard in the dog training industry. For A Kinder World through Dog Training. Welcome to the Instinct family, Instinct NNJ! Dr. Emily Levine, DACVB, graduated from the College of Veterinary Medicine at Mississippi State University in 2000. She completed a one-year internship at a specialty medical and surgical referral hospital in Arizona, followed by a residency in animal behavior at The Cornell University Hospital for Animals. After completing her residency, Dr. Levine moved to England where she ran the behavior clinic at the University of Lincoln, participated in clinical behavior research, and worked as an instructor. Dr. Levine is currently the Director of Behavioral Services at the Animal Behavior Clinic of AERA and is board certified in the specialty of Animal Behavior. She has authored several papers in peer-reviewed journals and textbooks, as well as co-edited international proceedings on behavior research. Suze Cullinan is a Certified Dog Behavior Consultant and graduate of the esteemed Karen Pryor Academy Dog Training Professional program. She specializes in pet dog behavior issues including fear, aggression, and anxiety, and is currently a full-time team member at Instinct East Harlem. Prior to entering the dog world, Suze spent years in a corporate career, leading large sales, account management, and implementation teams in the healthcare software and home care industries. She holds Masters degrees in Biology and Science & Technology studies. Suze is active in dog rescue and is a behavior foster parent for Distinguished Dobermans Rescue. Suze lives in Northern New Jersey with her four dogs, Baron, Koda, Brooklyn, and Frankie, and three cats.